Christmas is for Kids – Love Life Now Foundation, Inc.
Let’s face it, for the most part, the Holidays have gotten so commercialized that often times the true meaning of it gets lost in the shuffle…then you hear about organizations like Christmas is for Kids (CIFK). Around since 1972, they are a volunteer run, a gift-giving program that assists children who would otherwise go without a gift on Christmas Day. 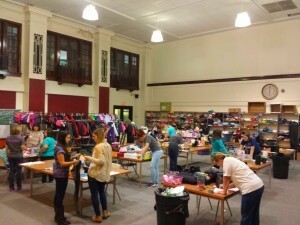 We first came into contact with the organization when an out of state Love Life Now friend was looking to donate gifts to children in a domestic violence shelter, so we reached out to New Hope who we profiled over the last year and found that CIFK organizes gift giving for all of the New Hope families during the Holidays. This helps alleviate the work for the shelter who are tasked daily with providing emergency housing, counseling, safety planning, etc. for victims and survivors. They have been able to assist close to 1,000 children each year thanks to the generosity and support of the public! The help they provide is not limited to those at shelters either. It can include those on some sort of public assistance, the “working poor” and those families who may be experiencing medical or emotional hardships. Today’s uncertain economic climate has put a financial strain on many working people and CIFK helps to fill in the gaps for their children. How does this all work? Well, I got a chance to visit their fabulous version of the ‘North Pole’ which all takes place in a school gym. I spoke with Kelly Fox who heads the operation. She told me that way before they get to work organizing and sorting donations, they accept applications from families which helps them carefully screen for a genuine need for help. 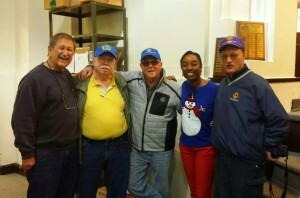 They collect items year-round from generous donors like the gentlemen from the Lion’s Club (pictured). 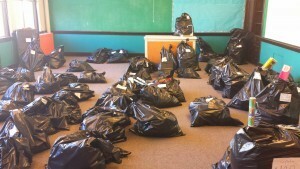 The donations are then sorted, bagged and numbered to correspond to each families’ needs. It means so much to volunteers (many who have been helping for over 20 years), to be part of and connected to such a tremendous effort. ‘Distribution Day’ as they like to call it is where the real gratitude comes when volunteers receive genuine thank you’s and see the tears of joy from families who are most times overwhelmed by everyone’s generosity. 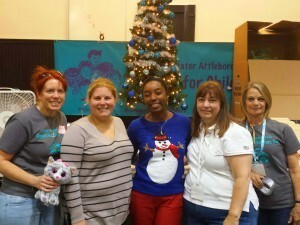 We will have more on my visit to Christmas is for Kids including video highlights in the next issue of Love Life Magazine www.lovelifemag.org. In the meantime, if you would like to donate or become a volunteer, please visit their website: http://councilforchildren.org/cifk/what-is.htm or find them on Facebook! While they officially call themselves volunteer advocates for children, I’d like to think their unofficial title suits them even better since they are truly real life ELVES!